This multi day package at the luxurious Commodore Hotel - V & A Waterfront provides an unbelievable experience of the beautiful city of Cape Town and allows travelers to experience the majestic view from Table Mountain and surrounding areas. 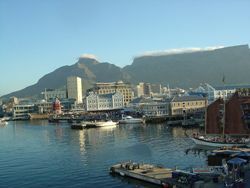 This package includes amazing tours of the bay and Table Mountain. Arrive in Cape Town to be greeted by 37 West Adventures' transfer service agent. Guests are then transfered to the hotel for an evening of leisure. Guests are collected at the hotel at 9:00 am for a full day Cape Peninsula tour of the bay along the Atlantic ocean. Guests are then returned to the hotel for an evening of leisure. 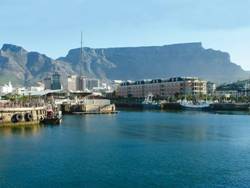 Guests are collected at the hotel at 8:00 am for a half day Table Mountain & City tour, where guests experience the magnificent view from Table Mountain. Guests are then returned to the hotel for an evening of leisure. Guests are collected at the hotel at 9:00 am for a full day Winelands tour through the beautiful Paarl Valley, Franschhoek and Stellenbosch areas. Guests are then returned to the hotel for an evening of leisure. Guests are collected at the hotel at 6:00 am for a full day Great White shark cage diving tour, where guests can either surface view, scuba cage dive, or snorkel with these magnificent creatures. Guests are then returned to the hotel for an evening of leisure. After all the excitement of day 5, guests are given a chance to relax and have a day of leisure. Guests are collected at the hotel at 5:30 am for a full day Aquila Wildlife Safari tour, where guests have opportunity to view amazing wildlife including Lions and Rhino. Guests are then returned to the hotel for an evening of leisure. Guests are given a chance to relax and have a day of leisure on this last day of the 7 day package. Guests on the 7 night package are then transfered to the airport for their departing flight.